SILICON SLOPES, UT – August 17, 2017 – Domo announced that its business management platform – the Domo Business Cloud – was selected by Lawson, Inc., a major Japanese convenience store operator with over 12,000 stores in all 47 prefectures of Japan. Domo was selected to help improve business productivity and facilitate faster, better decision making for business leaders of Lawson’s online shopping site, ‘Lawson Fresh’. The business model of Lawson Fresh is one that focuses on customer convenience, providing everything from household goods to fresh produce and groceries, including time-saving grocery products. 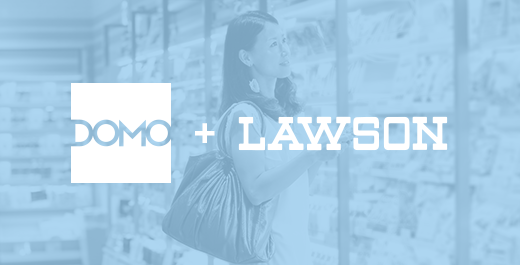 Domo supports Lawson by presenting business leaders with the information necessary to make better, faster business decisions that meet the changing needs of its customers. This is done by integrating and visualizing many different sets of data in real-time, ranging from daily sales figures to website traffic. With Domo, both reduction of manual data table analysis and improved business productivity are expected in the organization. In addition, Domo enables users to easily develop and update business reports, enabling managers to make business decisions without having to wait for the next meeting. These meetings can now be a place to discuss actions points as well as upcoming plans, thus improving the productivity of the business. Domo helps all employees – from the CEO to the front-line worker – optimize business performance by connecting them to the right data and people they need to improve business results. Domo’s Business Cloud is the world’s first customizable platform that enables decision makers to identify and act on strategic opportunities in real time. The company works with the world’s leading and most progressive brands across multiple industries including retail, media and entertainment, manufacturing, finance and more. For more information, visit www.domo.com. You can also follow Domo on Twitter, Facebook, LinkedIn, Google+, Instagram and Pinterest. Domo, Domo Business Cloud and The Business Cloud are trademarks of Domo, Inc.